This is the Big Shawl Project. The perfect yarn, the perfect color, the perfect pattern... but such a big project, such a mammoth task, who knows if I'll ever finish it. Here's hoping. I've finished the center section of this Wings of a Dream shawl, a modification of the mystery stole Swan Lake. I only knit a small piece of the center section, because I want the wings to be the main focus of the shawl. I started this shawl... let's see... the first of February, and now it's May, and I still have a long way to go. I've just started the first wing section. I should be working on this at a little quicker pace though, because I received some inspiration in the mail (see earlier). It's a necklace called Verna, from The Pebble Collection. I fell in love with it as soon as I saw it, and it matches perfectly. It's pale silver-blue pearls and sterling silver. 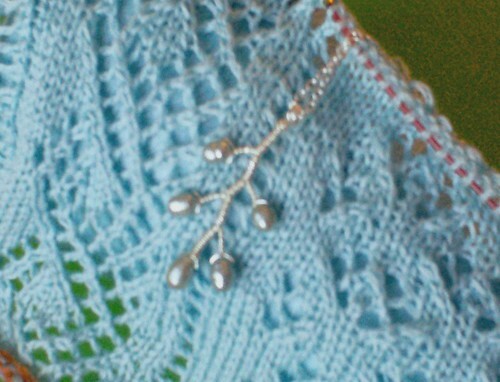 I hope to wear the necklace, along with the finished shawl, to my cousin's wedding in September. The shawl, by the way, is 55/45 Cashmere Silk fine lace weight, doubled, from Colourmart. It's totally luscious, and was way cheaper than you'd expect. Cashmere silk... more than enough for a shawl. I think I'm even going to have enough left in the 150g cone for another shawlette, probably an Icarus to give as a gift. Of course, before I start that Icarus, I have to finish this shawl. I have too many projects going, I know. What's an ADD knitter to do? Looks great so far. And that necklace is beautiful! I cannot wait to see this one finished! You always do such gorgeous work!!! What a great looking shawl and perfect necklace! Thanks for the nice comments! Best of luck to you! That necklace is to die for too! Find A .925 Silver Chain Online.